Note: Colder and warmer weather ranges represent forecast values when heating degree days are 10% higher or 10% lower than expected, respectively. 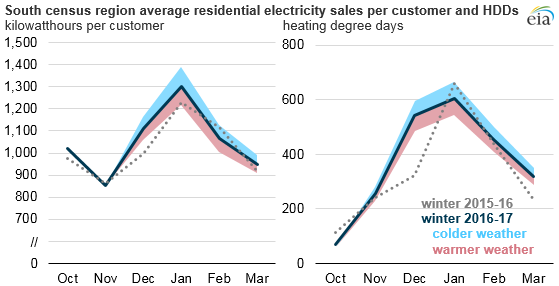 EIA’s Short-Term Energy Outlook (STEO) projects that the average residential customer will consume 4% more electricity over December through March compared with the same period last winter. However, this forecast is highly dependent on winter temperatures. If temperatures are warmer than expected, as they have been the past two months, average electricity use could be slightly below that of the previous winter. Seasonal electricity consumption patterns in homes vary regionally, and some regions reach their peak electric load in the winter when the weather is extremely cold. Consumption of electricity rises in the winter because the days are shorter (i.e., more lighting usage) and some homes heat with electricity, either for their primary heating equipment, such as electric furnaces or heat pumps, or with secondary heating equipment, such as space heaters or electric blankets. Space heating with electricity is common in the South census region, where nearly two-thirds of households heat primarily with electricity. Even though this region’s electricity consumption is highest in the summer, Southern electricity consumption in the winter is sensitive to changes in temperatures. Most areas of the United States experienced record warmth over the winter 2015–16 as a result of a strong El Niño weather pattern over the Pacific Ocean. The average temperature for the Lower 48 states over the months of October 2015 through March 2016 was the highest on record, based on data since at least 1895. 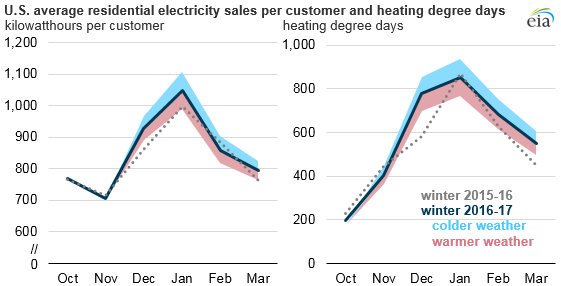 These very warm winter temperatures reduced electricity use. The average U.S. residential customer used 4,985 kilowatthours (kWh) between October 2015 and March 2016, the lowest level since the winter of 2001–02. In the South census region, the average residential customer consumed slightly less than 6,100 kWh last winter, which was the lowest since 2011–12. EIA’s Short-Term Energy Outlook uses weather projections from the National Oceanic and Atmospheric Administration’s (NOAA) Climate Prediction Center to develop the STEO’s expectations of weather and weather-related energy demand. NOAA publishes forecasts of heating degree days, which use temperature and population data to estimate expected heating and cooling needs. Warmer weather means fewer heating degree days. NOAA expects U.S. heating degree days between October 2016 and March 2017 will total 3,466. This level is about 8% lower (or warmer) than the amount of heating degree days during a normal winter. However, this level is not as warm as the winter of 2015–16, when heating degree days totaled 3,198. EIA projects that the average U.S. residential customer will use 5,100 kWh of electricity this winter, 2.4% more than last winter. 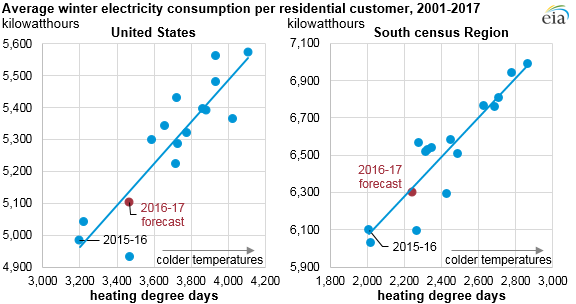 Based on NOAA’s projections, residential customers in the South census region should also experience temperatures colder than last winter, with EIA forecasting the average customer will use 6,300 kWh of electricity, or 3.3% more than last winter. However, household heating expenditures are not expected to change significantly because electricity prices on average are expected to be slightly lower this winter.